High productivity dual turret slitter. The X6t Dual Turret Slitter Rewinder is suitable for film producers and flexible material converters. The X6t is capable of processing a wide range of films, foils, papers and laminates. Turret slitters increase productivity by reducing the downtime deficit slitter rewinders encounter when unloading a completed slitting job and preparing for the next slitting job. A turret slitter enables the machine operator to unload a completed set of rolls while the next set is running. 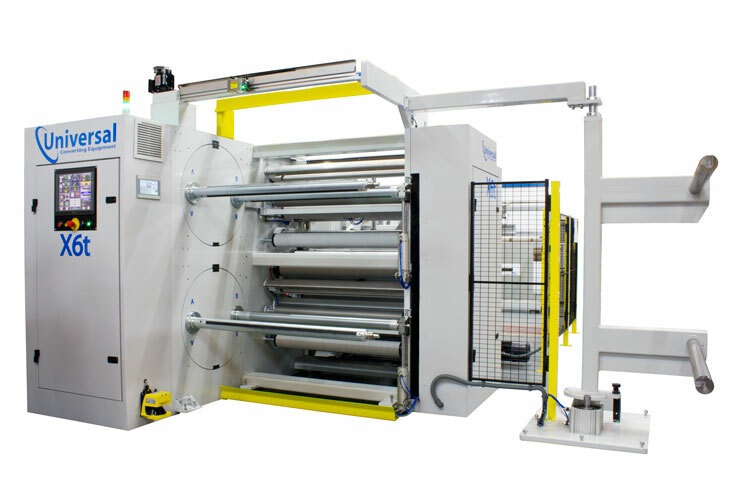 The Universal X6t slitter is a variant of the popular Universal X6 Flexible Materials slitter rewinder that has been designed to capitalise on the efficiency and accuracy features that make the X6 range an easy purchase, not just for converter of flexible packaging materials, but also for companies slitting foils, papers and a wide range of other materials. The turret capability of the X6t perfectly compliments the other automation options – including laser core alignment, automatic shear and razor knife positioning, automatic core positioning, end of roll cut off and off-loading pushers with roll handling- to produce levels of efficiency and operator simplicity surpassing many competitive machines.